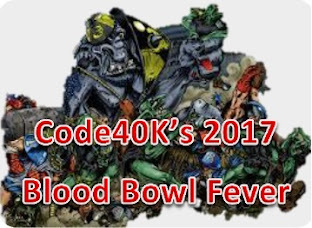 It seems the Blood Bowl bug has hit the Code40K crew pretty hard, with everybody getting on board and throwing paint onto teams! What's even more cool is that there seems to be a pretty good spread of teams, everybody settling on something different to one another - should be a solid opening season! 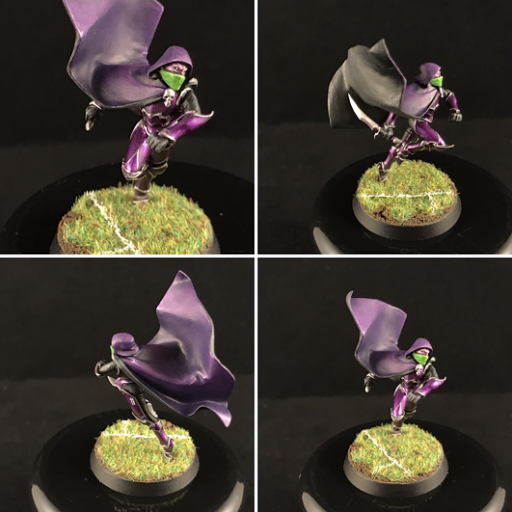 I've always been rather partial to the Dark Elves style of play, but with a distinct lack of Elves from GW currently my mind was running amok with ideas. 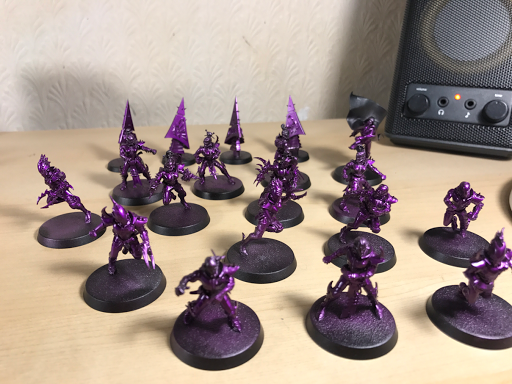 Having done a large Dark Eldar commission previously and having a friend run Dark Eldar in 40K, I Knew the perfect place to start. 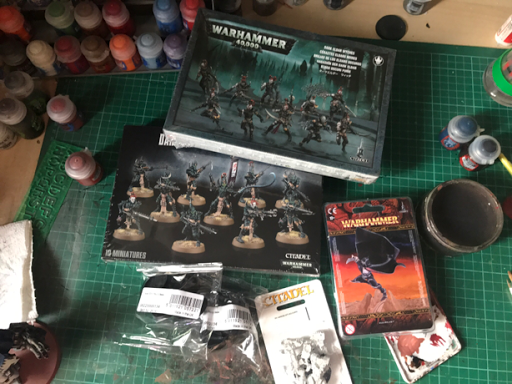 A little math and I worked out I could get a solid starting line up from a box of Wyches, a box of Kabalite Warriors and an AOS Assassin model. 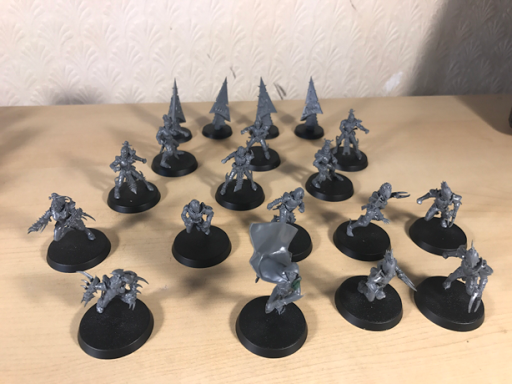 I mixed and matched the boxs, Wych legs on Warrior bodies and vice versa and managed to come up with 6 Line Men, 2 Runners, 2 Witchs, 4 Blitzersand an Assassin - not bad at all! 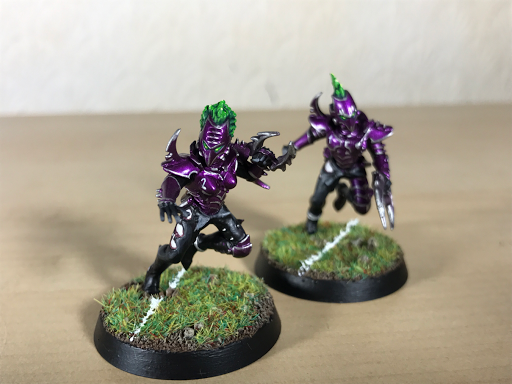 I also knocked up a couple of markers from the shock prows of Ravagers. The colour scheme was easy to settle on, I'd been looking for an excuse (honestly, any excuse would have done!) 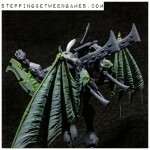 to play with the FW clear Purple I'd tried on the flier base for the Knight Acheron an these where the perfect chance. Until then, thanks for reading and let me know what you think! Phew! What a paint filled couple of days that's been! 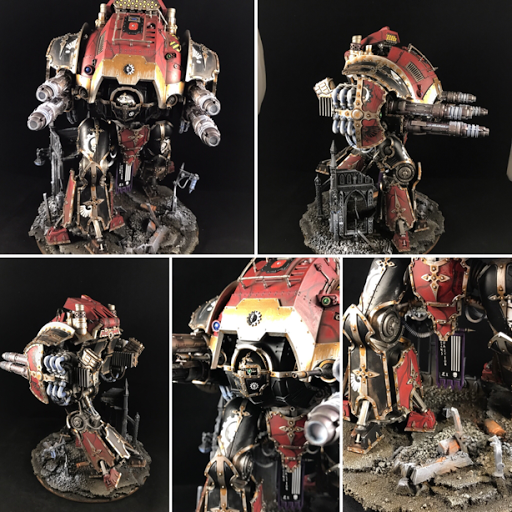 Since it saw the Acastus Knight previewed at the Forge World Open Day I knew I wanted one but didn't actually expect to own one any time soon. Then Christmas came and maybe I got all caught up in the spirit of giving but anyway it happened I ended up ordering myself one! Haha no regrets! 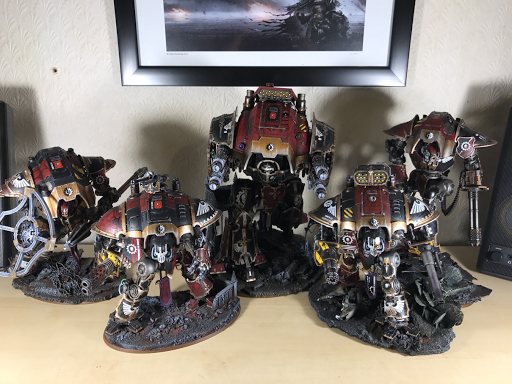 Whilst I've been privileged to work on no fewer than 7 Imperial Knights over the last couple of years, I always seem to forget just how much of a time and space investment they are, and this guys is bar far the largest thing I've ever tackled. 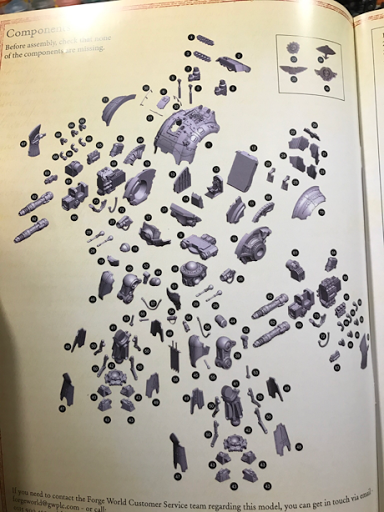 Once I'd gotten my head around the basic construction I set about deciding how I wanted the Knight to look and what I saw him doing in my mind. I wanted to attempt to inject a little more movement in the model than I'd seen so far and fortunately the FW kit is pretty good at allowing different positions, I did however run into a few issues with pistons being too short once I had positioned the one leg and later found the armour panels clashed so ended up having to break the leg apart (rather scary...) and rebuild it. Fortunaly the rebuild actually looks all the better for it so no harm done. As I have probably mentioned before, I'm a massive fan of basing models so I figured "Let's start from the ground up" and set about making a suitably scaled area for the Knight to be operating in. 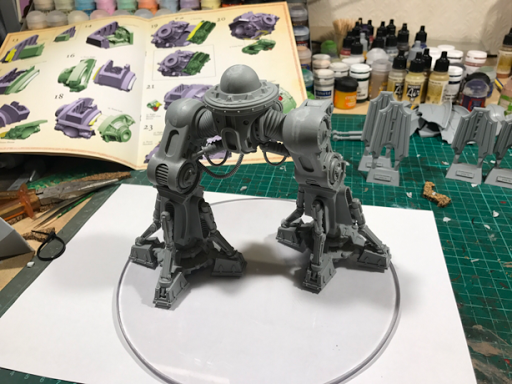 Unfortunately the Acastus doesn't come supplied with a base (160mm being the largest GW manufacture) so I knocked up a 200mm base from some clear Perspex I had laying around at work. 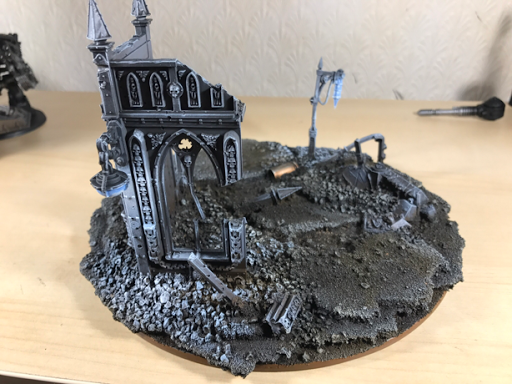 Then added some ruins, sand, rocks, FW casting blocks and a stray 9mm shell and boom. Base set. Shout out to LukoDakka for the orientation advice, ruin to the rear 100% the right shout. With the base done it really was just a simple case of throwing down my Knight House Colours and getting stuck in. 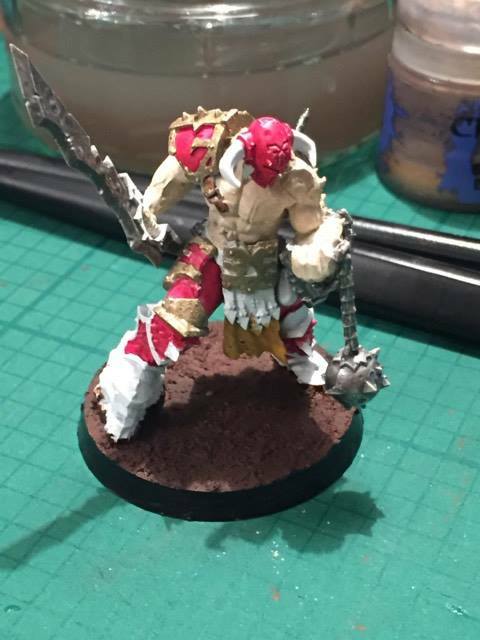 I'd still got a few days off of work so with the wife at work I managed to attack him pretty hard for three days of straight painting. All told I'm chuffed with him, I'm not totally happy with the paint job and a few things have irritated me in the venture but I'm probably just being overly critical of myself. Anyways, here's a group shot of him with his brothers.. Anyway - I'd better dash as I've a doubles tournament to prepair for in the morning that a few of us from the Code will be attending! 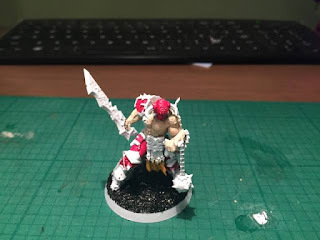 As promised I am back with the voting post for all our Slaughterpriests. 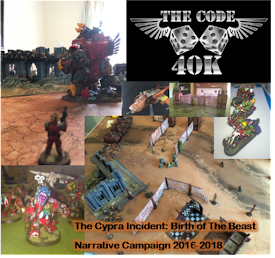 I hope you have enjoyed our little internal code40k painting competition. So now its time for you the readers to vote for your favourite via comments below please. If you are feeling brave your top 3 would be good. Code guys you can also vote but not for your own! Please comment below. Each name is also a link to the original post allowing you to look at more angles should you desire. Look forward to seeing who comes out on top. Happy New Year readers! 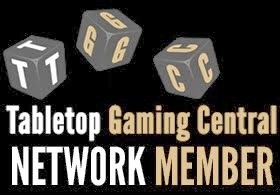 DOC here with my entry to our December event and we are now into January woops! 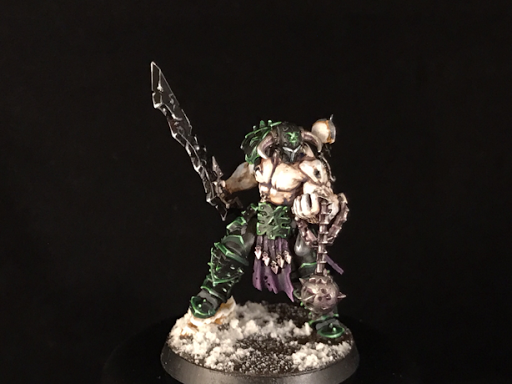 Anyway mine is somewhat of a rush job but he is at least finished. It also the first time in many years I have not glued sand onto a base which was a nice change! I used vallejo black lava which is a gritty paste. I think it has worked out well base wise. The model itself has been painted in standard Khorne colours with a simple base, wash and single highlight method. 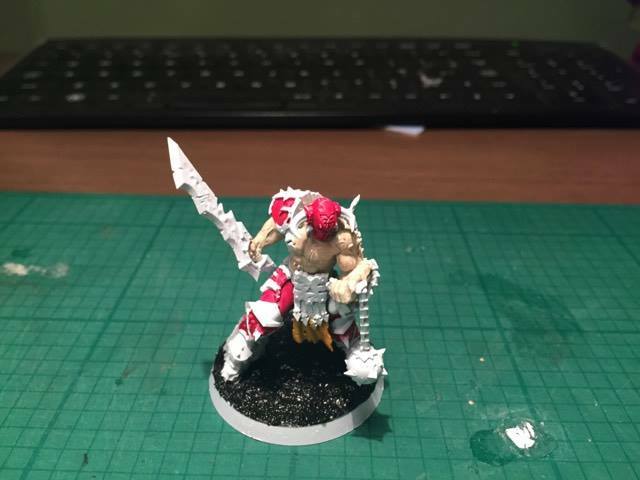 I used this as a getting back into hobby piece having not painted since September. In a couple of days I will put a voting post asking for all you fine readers to vote for your favourite of all the slaughter priests. 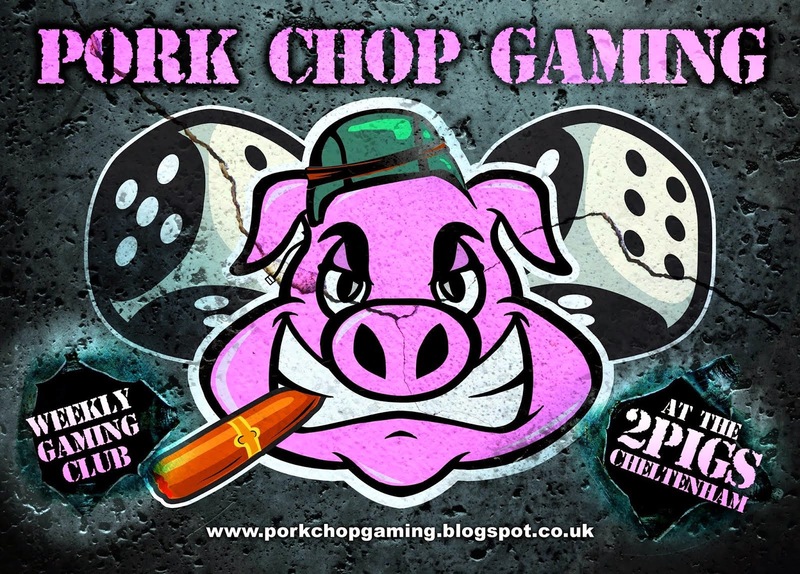 Anyway enough chatter here are some work in progress and completed pictures. 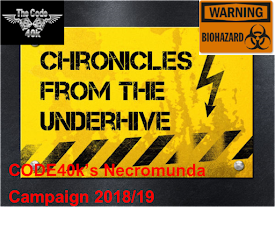 Comments are most welcome look out for the voting post in the coming days. 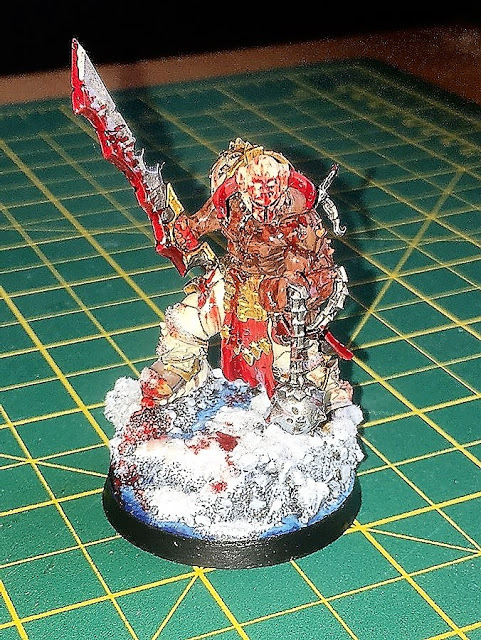 Here is my take on Dismember December, although joking with the others, it should really be for New Years Evil as I was finishing this guy off on the eve of 2017. Painting wise I used the airbrush for priming, base colours and the first and second highlight, enough to allow me to go in and do the detail work, edge highlighting. Had a little blast with non-metallic metal, experimenting with a darker gold as it suits Chaos quite well I think. I simply use a great colour Vallejo Japanese Uniform, mixed in a little black and worked up to white. The red was done by painting black to white and then glazing thinned mephiston red over the top. 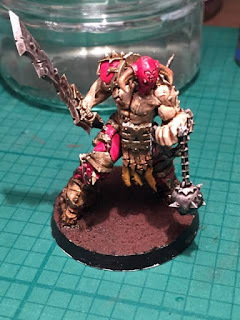 The skin was Vallejo Heavy brown, highlighted by simply adding more white, a shade of umber wash was then applied to tone it down a bit and then a mix of tank brown and heavy brown was added to give a bit of depth to the muscles. The base is cork for the rock and a fine detail filler was used between for the lava. This was airbrushed with Vallejo Italian Red, Hot Orange, Gold Yellow, Sunburst Yellow & the hottest spots with Ice Yellow/white. The rock was drybrushed Vallejo Black Grey and Light Grey and mephiston red slightly round the inner edges. 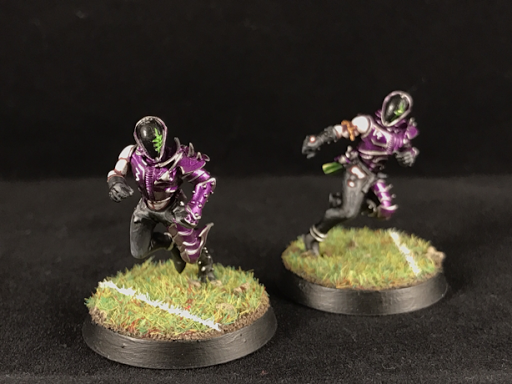 I really enjoyed painting this and it was nice having the freedom of a one off miniature to paint. This has got me itching to get started on a neglected Silver Tower Boxed Set so that may pop up at some time.